Join us on July 6th at 6PM for "Celebrating Independents Week"
We’re passionate about localism and we’re going to show you the importance of supporting locals businesses and how that creates a positive impact on our local economy. From sourcing food locally to spending dollars wisely, the success of localism relies on all of us making the decision to participate. 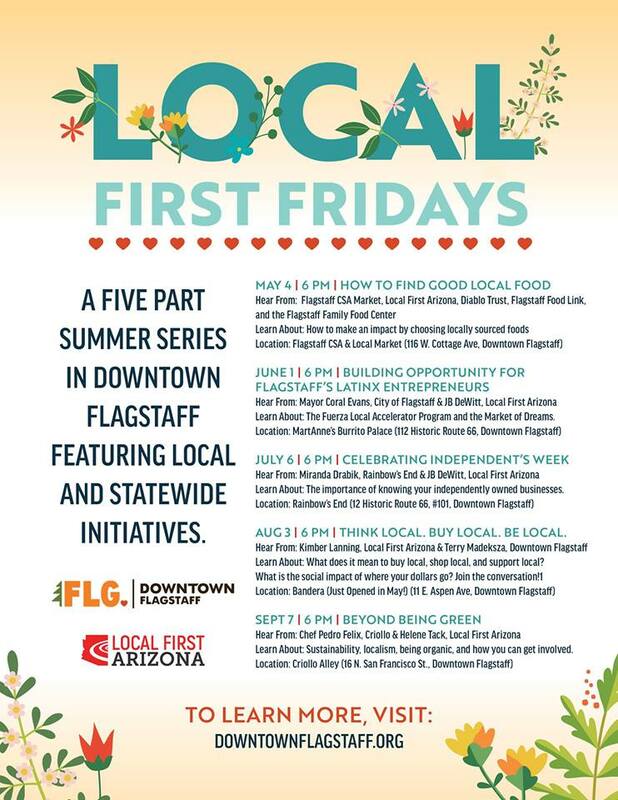 Local First Arizona and the Flagstaff Downtown Business Alliance are partnering to host 5 engaging conversations that offer easy changes to the way you spend, giving you the power to impact your community. Topics include initiatives like the Good Food Finder, Food & Farm Forum, How to Source Food Locally, Independent’s Week, The Market of Dreams, and Fuerza Local.